After reading a few of the S-1 analyses on this blog, an entrepreneur asked me to look into the balance sheets of public SaaS companies. More specifically, how much cash should SaaS hold? How much equity do they raise? And do they employ debt to grow? 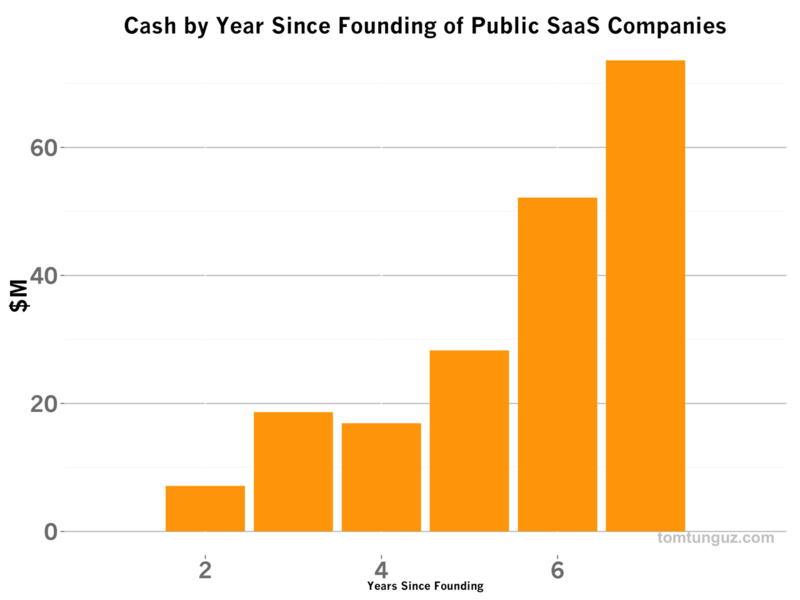 The chart above shows the median cash on the balance sheet by year of founding for publicly traded SaaS companies. 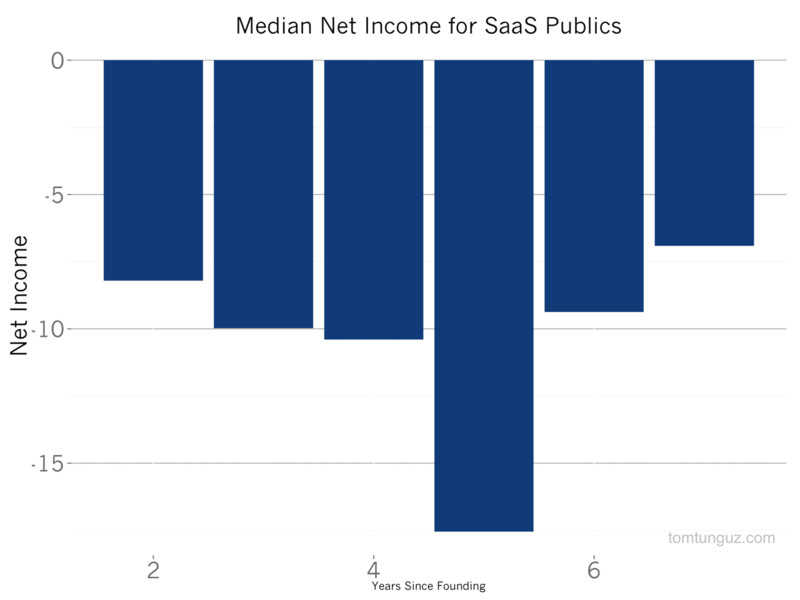 By its second year in business, the median SaaS company in this data has about $7M on its balance sheet at year two, from either the combination of a large seed round and Series A, or just a large A. The company grows quickly enough to raise a $12-$25M Series B in the next 12-18 months, which is year 3 or 4 in the company’s life. The business deploys that capital to continue growth at which point it raises another $20-30M in its Series C in year five, and another $20-$30M in year six which should be the final round before IPO. 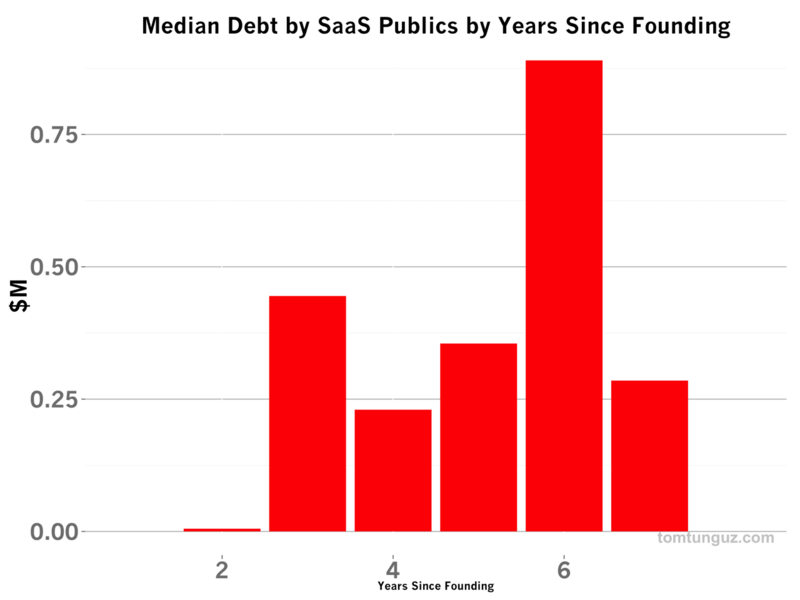 Most often, SaaS publics IPO in year seven, but this figure varies quite a bit. Let’s look at the net income data to see how much of the venture capital the median SaaS company consumes over time. The bar chart above depicts the median net income by year since founding. In year 3, the net income is about -$7M, then -$11M. The net annual loss peaks in years 5 and 6 at just about -$17.5M. In all, the median publicly traded SaaS company invests $60M to develop its product and grow before it goes public. In addition, it holds about $28M in on its balance sheet at IPO for a median total raise of about $88M before IPO. The typical size of a SaaS IPO is $82M, In total, the median SaaS publicly traded company raises $170M in total, through IPO. Now, for the question of debt. 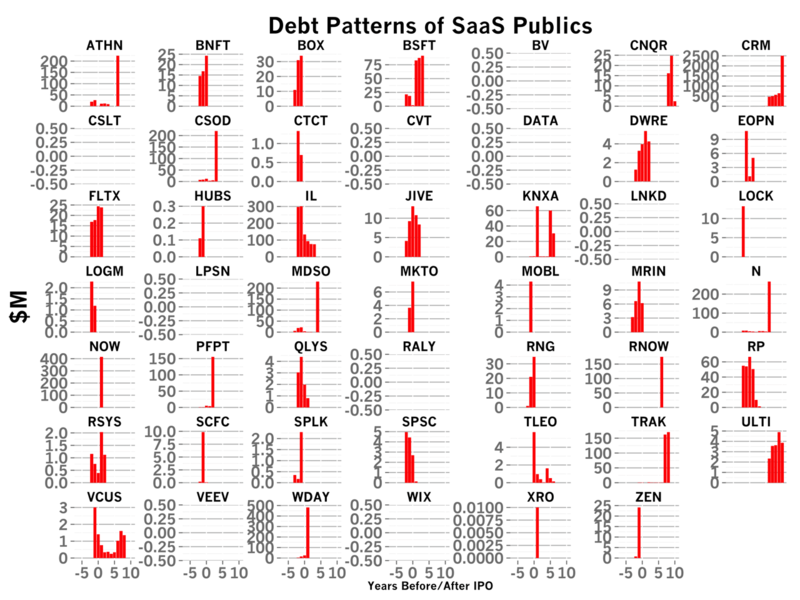 60% of SaaS publics have employed debt of some sort before going public. But as the chart above shows, the median amount of debt is quite small, at or below $1M every year. In other words, the vast majority of SaaS growth to date has been paid for with equity dollars. This may be for a few reasons. First, the equity markets have provided large amounts capital relatively cheaply. Second, debt must be repaid. Most SaaS companies operate at negative net income, so the debt repayment is unlikely to be made from free cash flow. Instead, it will be repaid with equity dollars. If equity can be raised easily, why bother with debt? After IPO, it’s a different story. I’ve plotted the debt patterns by company above and changed the x-axis to be years before/after IPO. It’s much more common to see SaaS companies raise debt after IPO than before, at which point, they may raise huge amounts. Salesforce, for example, has about $2.5B in debt. NetSuite has about $200M. But these are exceptional cases, many years after IPO. In the early stages of SaaS companies, debt is either used in relatively small amounts, compared to equity, or simply not at all. I should note there are many successful paths to market and the median doesn’t mean the right path to market. I have written extensively about Veeva, which raised only $4.5M before going public. This analysis is for the median SaaS company in a basket of 41 companies with S-1s, and the median hides a lot of variation in the data.